The latter part of January has seen a substantial amount of time spent in the handsawgeek shop. There have been no woodworking projects going on. There has been no tool refurbishing or sharpening happening. There have not even been any woodworking project plans drawn up. Instead, that time has been spent in doing a major – and I mean MAJOR – re-model and renovation of the shop. 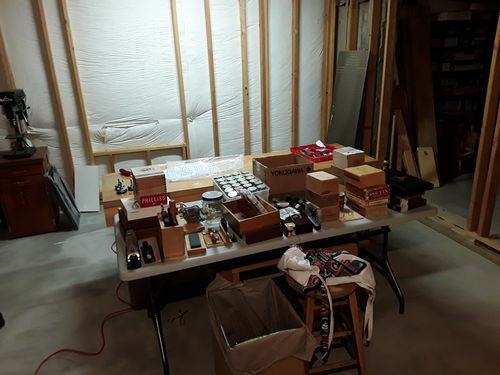 Mrs. handsawgeek and I have decided that the present shop – filled with mis-matched benches, desks, cabinets, tool racks, boxes, bins, and cobbled together shelves is just not aesthetically pleasing. Nor particularly efficient, for that matter. 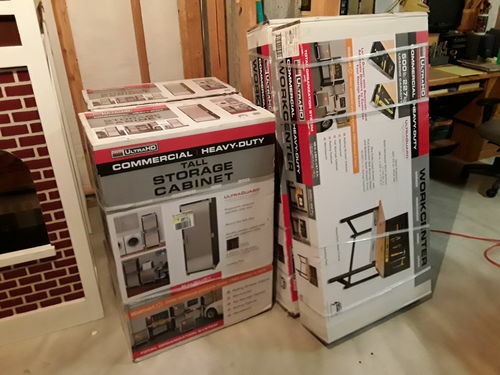 So, a couple of weeks ago, I was wandering around the local WalMart store, when I spied some interesting items in the hardware/tool department – some heavy duty all-steel tall storage cabinets and workbenches. A close examination revealed that this shop furniture was definitely not the typical plastic/particle board junk that one would be accustomed to seeing at this particular retail establishment. This stuff looked well-constructed and high-quality. And the price point was very reasonable. The manufacturer is Seville and the brand is UltraHD. Made in USA. Can’t go wrong there. Back home, I made a quick online check for product reviews. Consistent 4 and a half stars with a lot of positive comments. I was sold. I took Mrs. handsawgeek back to the store to float the idea of purchasing a couple of the items. She was impressed enough, and I exuded enough enthusiasm, that we ended up purchasing three of the cabinets and two workbenches !! It was quite an exercise for me to haul the five heavy boxes home, off-load them, and wrestle them down the stairs and into the deep recesses of the basement shop. Before assembling the items, of course, I had to clear out the shop space where they were destined to go. Out went the old waterbed headboard that I was using for hand tool shelves, the Amish glass-front entertainment center, the Sauder particle-board desk, and a few other random cheap shelf units and cabinets. Down came the scrap-wood shelves and fixtures that I had knocked together over the years. The only previous pieces of shop furniture that would remain in the new order of things would be the woodworking bench, and the saw bench. Mrs. handsawgeek was reluctant to let me retain the latter, because it contrasts starkly with the new shop furnishings, but I convinced her that it was an extremely essential shop tool – which it is, and gets used extensively for every wood project -which it does. 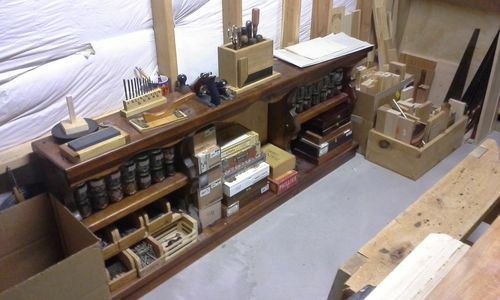 Plus, I would be able to store it neatly out of sight under one of the new workbenches. Next post: Getting busy with a screwdriver and a few wrenches…. Wonderful! This is an excellent time of year for remodeling your workshop. Thanks for sharing your progess. Looking forward to seeing more. Decluttering is never ending. Congrats on the plan!